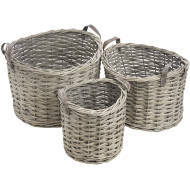 Beautiful and practical - what more could you want from our baskets. Ideal for displaying flower arrangements, we are sure we have a basket to suit the style you are wanting. Baskets can provide a lovely display place for plants and flowers, they can also add an enormous amount of texture and style to your interiors all whilst being practical...there is nothing not to love.